Contact us if you are looking for a book not listed here. *All books are subject to availablity from the publisher. **Prices subject to change without notice. The aim is to facilitate international trade in animals and animal products and to contribute to the improvement of animal health services world-wide. The principal target readership is laboratories carrying out veterinary diagnostic tests and surveillance, plus vaccine manufacturers and regulatory authorities in Member Countries. The objective is to provide internationally agreed diagnostic laboratory methods and requirements for the production and control of vaccines and other biological products. 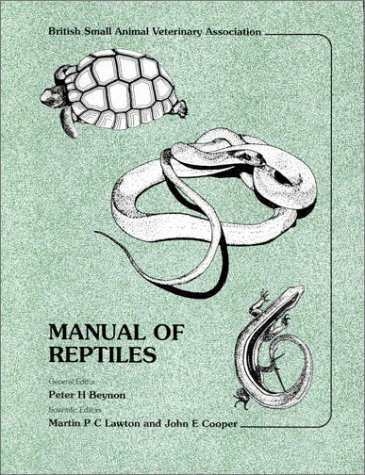 The Terrestrial Manual, covering infectious and parasitic diseases of mammals, birds and bees, was first published in 1989. Each successive edition has extended and updated the information provided. This seventh edition includes over 50 updated chapters and guidelines (including a new guideline on the application of biotechnology to the development of veterinary vaccines, and the addition of epizootic haemorrhagic disease to the relevant chapter). This edition has a slightly different structure from former editions: Part 1 contains ten introductory chapters that set general standards for the management of veterinary diagnostic laboratories and vaccine production facilities; Part 2 comprises chapters on OIE listed diseases and other diseases of importance to international trade; Part 3 comprises four guidelines that have been developed on topics such as biotechnology and antimicrobial susceptibility testing that are intended to give a brief introduction to their subjects (they are to be regarded as background information rather than strict standards); and Part 4 is the list of OIE Reference Centres at the time of publication. In this book the authors describe the implements and techniques in use today for internal fixation in large animals. Pre-and Postoperative care are covered, as are first aid and patient management. The recommedations will help veterinarians avoid many of the pitfalls they may encounter in the course of treatment. The book will be especially useful to those who have participated in practical ASIF courses, and will encourage them to continue updating their knowledge of reseach developments in this field. 106 pages. This book is the cutting edge of reptile veterinary care. 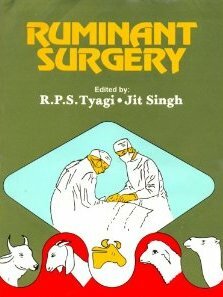 Chapters: Management in Captivity; Examination and Diagnostic Techniques; Post-Mortem Examinatio; Laboratory Investigations; Radiological and Related Investigations; Integument; Cardiovascular System; Respiratory System; Gastrointestinal System; Urogenital System; Neurological Diseases; Nutritional Diseases; Miscellaneous; Ophthalmology; Anaesthesia; Surgery; Therapeutics; with appendices on: Useful Addresses; Clinical Examination and Post-Mortem Sheets; Haematological and Biochemical Data; Legal Aspects; Conversion Tables. 228 pgs. 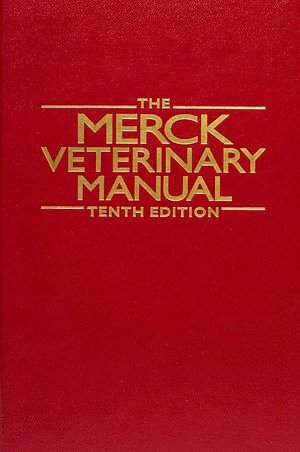 The Merck Veterinary Manual is the most comprehensive, reliable reference for veterinary professionals. Trusted for more than 50 years, this reference now features hundreds of full-color images, including illustrations, photomicrographs, and radiographic, ultrasonographic, and endoscopic images. In addition, all 3,000 pages have been updated to reflect the latest advances in veterinary medicine. This new edition offers comprehensive coverage of exotic and laboratory animals and an extensively revised zoonoses reference table. The section on behavior has been thoroughly revised, and includes the most current information on diagnosing and treating behavioral disorders in dogs, cats, and other domestic animals. The Merck Manual has also been completely redesigned for easier reading. Offering a colorful new look at animal health, this edition is truly indispensable. 2945 pgs. This book is full of tips from over 100 Holistic Veterinarians with more than 1000 holistic remedies for over 100 illnesses & conditions. 466 pgs. Includes the effect of Toxic substances, physiological conditions, trauma. Some subjects covered include: Anatomy, gastric secretion, digestion, camel feeds, nutrient composition of camel diets, foraging behavior, dry matter intake, nutrient requirements, protein requirements, mineral requirements, water requirements, feed composition tables, feed data tables. 97 pgs. Contents: Pain terminology, physiology, perception and strategies for management; analgesic drug formulary and techniques; managing pain for specific conditions and procedures including trauma patient guidelines; controlling chronic pain. Illustrations. (w/CD-ROM) 125 pgs. The parasites included in this book are the helminth parasites (nematodes, cestodes, & trematodes) & the arthropod parasites (ticks, mites, lice & flies). The first part is an introduction or summary of the several most important internal & external parasites of the host species. The second part is an overview of the parasite groups, their life cycles, seasonal variations in numbers, damage caused to hosts, & control measures. The third part provides a detailed description of each significant parasite & is intended to serve as referece material. Includes a glossary of terms & a list of references. Line drawings & color photos. 69 pgs. 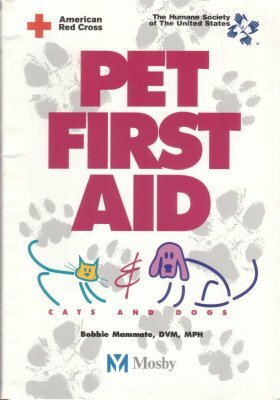 Designed to provide assistance and guidance to the pet owner in case of an emergency, this book includes coverage of CPR, choking, bleeding, trauma, poisoning, thermal emergencies, various wounds, and more. Suggestions are also given for items to be included in a pet first aid kit, plus tips on regular pet care, neutering and spaying, and traveling with pets. 150 illustrations. 114 pgs. 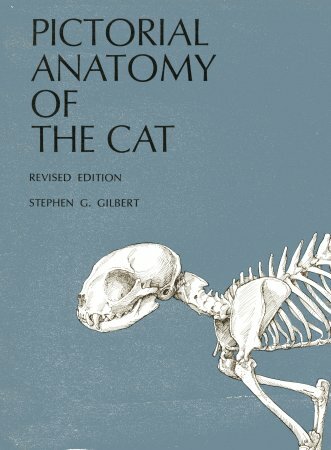 This book is designed for use as a dissection guide in comparative vertebrate anatomy or in mammalian anatomy. The illustrations are designed to enable the instructor to point out the important features of areas which cannot be dissected in detail by every student. Chapters: skeleton, muscles, digeative & respiratory systems, urogenital system, circulatory system, nervous system, eye, ear, along with a bibliography & definitions of descriptive terms. The author uses a combination of diagrammatic marginal illustrations, which are labeled directly, & larger realistic illustrations which are labeled with numbered keys. 120 pgs. 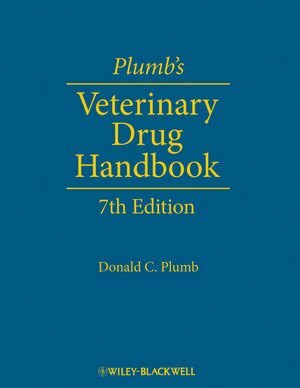 Now in a fully updated seventh edition, Plumbs Veterinary Drug Handbook remains the most complete source of drug information relevant for animals available. 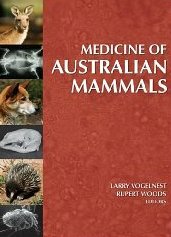 Providing referenced dosing recommendations in each monograph, this book offers doses for a wide range of species, including dogs, cats, exotic animals, and farm animals, in a single resource. The book also includes detail on key aspects for appropriate use of each drug, including pharmacology, pharmacokinetics, contraindications, adverse effects, safety during pregnancy or nursing, overdoses, drug interactions, monitoring, chemistry and stability, storage, compatibility, and available products. The seventh edition adds 22 new drug monographs, as well as updated dosages and information for existing drugs. A noteworthy feature is the Prescriber Highlights section found at the beginning of each monograph that allows readers a quick method of finding important information for that drug. Plumbs exhaustive one-volume coverage of drugs approved for veterinary species and non-approved (human) drugs that are used in veterinary practices today make this book an essential reference for veterinarians, veterinary technicians, veterinary pharmacologists, pharmacists with veterinary patients, animal research or zoological facilities, and libraries that serve these groups. 1208 pgs. Diagnostic tool, approx. 1000 color photos, approx 30 minutes of digitized clinical signs on a CD-ROM. A book containing much valuale information on the care and treatment of cattle, horses, swine, sheep and poultry and a review in alphabetical order of the diseases to which they are subject, together with the causes and symptoms ad the most efficient medicines for each. A first aid manual for all sheep farmers and veterinary students: with essential info on improving lamb mortality and avoiding stress at lambing time, new material on zoonotic infections, handling and storage of drugs, flock health plans, considerations for organmic producers, color photos to aid in diagnoses and treatment of diseases. B/W & color photos. 247 pgs. A first aid manual for all sheep farmers and veterinary students: with essential info on improving lamb mortality and avoiding stress at lambing time, new material on zoonotic infections, handling and storage of drugs, flock health plans, considerations for organmic producers, color photos to aid in diagnoses and treatment of diseases. B/W & color photos. For over twenty years 'The Professional Handbook' has been the definitve text for veterinary surgeons & others with a serious interest in donkey medicine & surgery. Much of the knowledge in this book comes from the meticulous records kept on every donkey at the Donkey Sanctuary in Devon, England. The skill of the Sanctaury's veterinary surgeons, non-intrusive research and observations by the staff who care daily for the donkeys have contributed greatly. In this 4th edition the contents have been completely revised & expanded & new chapters and a Formulary have been added. Chapters include: nutrition, colic, hyperlipaemia, dental problems, parasites, respiratory problems, skin disorders, wound management, the foot, conditions of the eye, clinical pharmacology, care of the gariatric dobkey, exotic infections, anaesthesia & sedation, surgery, reproduction, nursing care, community animal health workers, & performing a post-mortem. With appendices on: physiological, haematological & biochemical parameters; formulary; hearth girth nomogram; nutrient content of common foods fed to donkeys in the UK; care of orphaned & rejected foals; opthamalmic exam sheets, dental exam sheets (Triadan chart) & post-,ortem form; rig test; fertility of mules; & useful information. 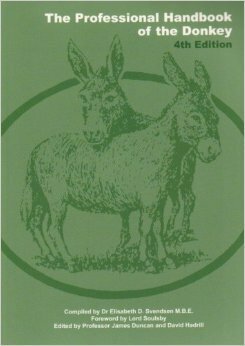 This book is indispensable to veterinarians working with donkeys & mules anywhere in the world. Profusely illustrated in color. 438 pgs. 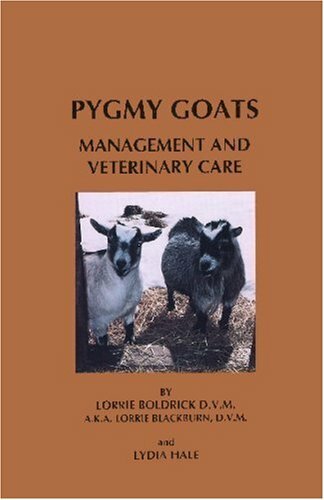 Chapter headings include: Normal pygmy goat (normal values, description and anatomy), Management (housing, feeding, vaccination, parasites, hoof trimming, reproduction, neonatal care, fetal development, milking, necropsies), Veterinary care techniques (signs to check for illness, restraint, medications), Diseases and Surgical management (anesthesia, castration, cryptorchidism, ovariectomy, wattle removal, mastectomy, debleating, dehorning). The appendix includes drug doses. 237 pages, B/W photos and illustrations. This volume is intended as a guide to the diagnosis and prevention of infectious diseases and metabolic conditions in commercial ratites. The industry requires a professional and proactive approach to the enhancement of productivity and amelioration of managerial, environmental, and disease-related problems. Included is a comprehensive approach to enhancing ratite productivity through integration of scientific knowledge of nutrition, management, disease control, and therapy. There are contributions by more than 15 experts in specific fields. 214 pgs. A basic text & companion work to clinical textbooks of obstetrics & gynacology. Discussions of species differences, reprodcutive behavior, & the effects of environmental factors. 136 pgs. Ropework, chemical restraint, stress, thermoregulation, medical problems during restraint. Domestic animals include: horses, donkeys, mules, cattle & bovids, sheep, goats, dogs, cats, laboratory rodents & rabbits, poultry, waterfowl. Wild animals include: montremes, marsupials, small mammals, carnivores, primates, marine mammals, elephants, hoofed stock, birds, reptiles, amphibians, and fish. B/W photos. 332 pgs. This book was written to bring together descriptions of restraint techniques published in many other sources and to provide a how-to book. It was designed to teach veterinary technician students the basic restraint techniques they will use. 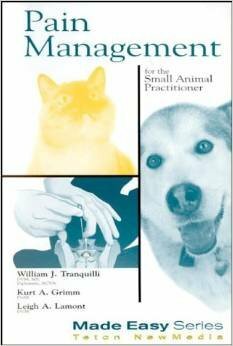 Covers restraint techniques for: cats, dogs, horses, cattle, pigs, sheep, goats, rodents, rabbits, ferrets, & birds; along with a chapter on how to tie knots. Includes many line drawings for each animal. 149 pgs. Over 2800 multiple choice questions with answers on: anatomy & physiology, anesthesiology, animal care, dentistry, emergency care, hospital management, lab animals, lab procedures, medical calculations, medical nursing, medical terminology, pharmacology, radiography, surgical nursing. This edition includes a companion CD-ROM with an additional 2,400 questions. 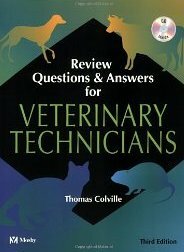 Prepare for final examinations, state certification examinations and the Veterinary Technician National Examination with this book and accompaning CD. 344 pgs. CBS Veterinary Science Text. Contents: Historical Perspectives; General surgical considerations & fluid therapy; Antimicrobial therapy; wound healing & tissue repair; suture material; anaesthesia; the integumentary system; the abdominal wall & peritoneum; the digestive system; hernia; respiratory & cardiovascular system; the urinary system; the genital system; the musculoskeletal system; physiotherapy; the nervous system; the special sense organs; neoplasms; postoperative care; electrocardiography; & diagnostic radiology. B/W photos. 484 pgs.